Resistance Temperature detectors (RTDs) are sensors used to measure temperature. Generally greater stability,accuracy and repeatability when compared to thermocouples. Slowly becoming the proffered temperature measurement device in many industrial applications because of high accuracy and therefor suitability for precision applications. Most RTD elements are made from a length of fine coiled wire of a pure material,typically platinum,nickel or copper wrapped around a ceramic or glass core. The material has a predictable change in resistance as the temperature changes. RTD works by correlating the resistance of the element with temperature.The hotter metal becomes,the greater its resistance. Lead resistance can contribute to measurement error,especially as wire length increases. Only used when high accuracy is not required. Resistance of connecting wires is added to that of the sensor,leading to measurement errors. The two leads to the sensors are on adjoining arms. 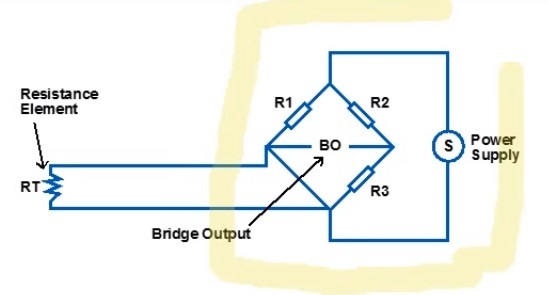 There is a lead resistance each arm of the bridge so that the resistance is cancelled out as long as the two lead resistances are the same. The device measures and removed the lead resistance in both sets of leads. RTD can be made cheaply in Copper and Nickel but these have restricted ranges because of non-linearity and wire oxidation problems in the case of Copper. Platinum is the preferred material for precision measurement because in its pure form Temperature coefficient of resistance is nearly linear;enough so that temperature measurement with precision +1 deg C or -1 deg C can be readily achieved with moderately priced device. 3.Accurate reading over relatively narrow temperature spans.